It was unexpectedly a nostalgic day for me at the festival, and bittersweet, as well, though I suppose nostalgia is always bittersweet. The last screening I attended today was Tsai Ming Liang’s “Stray Dogs,” and afterwards the director and his constant lead actor, Lee Kang Sheng, took the stage for a Q&A. At one point during the conversation Ming mentioned that his most recent films have not been shown in Korean, or even at BIFF, which I found surprising. I knew about his films before I came to BIFF for the first time in 2001, but it was here that I first saw him in person doing one of these Q&As, which, I have to say, he’s somewhat brilliant at. 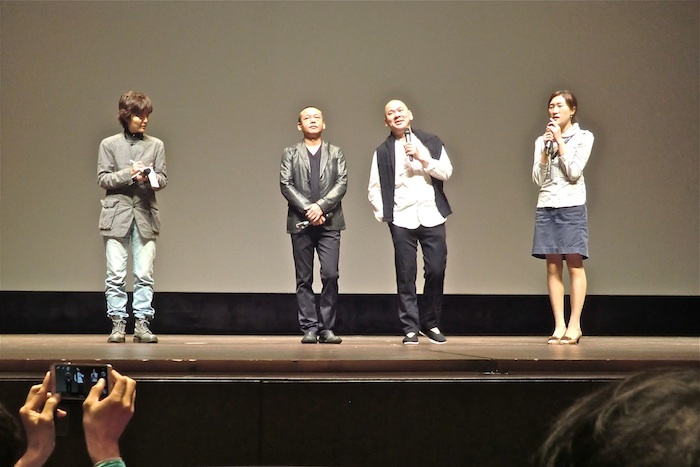 Regardless of the obviousness of the question he manages to turn it around and say something incisive about his work and its place in Asian cinema, and it seems whenever I came to BIFF, even when it was PIFF, he was always here. You would just see him walking around, talking animatedly with whichever Korean person he was with. I guess I’ve just missed his last several films, because if they had been shown here I’m sure I would have seen them. But then he said something I found very moving. “If you look carefully, you’ll realize that my films are getting slower and slower,” he remarked. “That’s because I’m getting slower and slower.” And I could see it; not so much that aspect of his films, but his general appearance, as well as Lee’s. When I first encountered this pair in the 90s, mainly through their masterpiece, “The River,” they epitomized the youthful potential of Asian progressive cinema. Now they’re well into middle age and look it. “Stray Dogs” reflects this change cosmetically. Lee plays a family man, albeit a homeless one, who sleeps with his two young children in abandoned buildings in Taipei while doing scut work as a sign holder for, of all things, luxury real estate. His wife has left him and for some reason Tsai has cast three different women to play her, which is very confusing given his usually vague narrative methodology. Also, one of the women is played by Lu Yi Ching, another Tsai regular who has played Lee’s mother numerous times in the past, so the passage of time is felt in more ways than one. In a sense, Tsai’s and Lee’s appearance this evening made me feel acutely the passage of years at BIFF. The movie itself, like the body of Tsai’s work, is almost beyond criticism. Digital technology has allowed him to indulge the kind of long takes he likes with even greater frequency, and apparently critics in Venice harped on the final take, which lasts something like twenty minutes and is simply a closeup of Lee’s character and his wife staring at a mural in their dilapidated apartment building. As is often the case in Tsai’s movies, there’s a lot of rain, and combined with the theme of homelessness it makes for a forlorn mood. At the Q&A Tsai talked about “the state of Taiwan, and the state of the world,” meaning, I suppose, that the great promise of Asian growth that was expected when he was starting out as a filmmaker was not kept. Of course, it contains a number of scenes, like one in which Lee devours a raw cabbage, that are absurd, but the absurdity has a melancholy cast to it. “Snowpiercer,” probably the most anticipated feature at the festival among the press people I talked to, was absurd by design, and pretty entertaining. It’s a true international blockbuster production, and director Bong Joon-ho, who made “Memory of Murder” and “The Host,” was up to the formidable job. Already there’s some scandal attached to the movie because Harvey Weinstein, who is planning on releasing it in the U.S., has reportedly asked Bong to cut twenty minutes. At 125 minutes, it’s no longer than most big budget sci-fi movies, and I didn’t think there was a lot of fat, though I suppose some of the fight scenes could be trimmed a bit. The whole movie takes place on a moving train, which is the last repository of human life on the planet after succumbing to a man-made ice age. The absurdity is built into the premise, since the train was designed by a super-engineer and runs on a track that takes it all over the world. And as in the real world, people have “their place.” The poor are stacked steerage style in the back of the train and the rich live in relative luxury in the front. The movie chronicles a rebellion by the masses as they make their way to the front under the direction of a reluctant leader played by Chris Evans. The rest of the international cast includes John Hurt, Ed Harris, Jamie Bell, Octavia Spencer, and Tilda Swinton in a hilariously broad performance as the train’s general manager. The Korean cast includes Bong regular Song Kang-ho as one of the technicians who designed the security system and Ko Ah-sung as his clairvoyant daughter. Though I found “Snowpiercer”‘s take on social Darwinism trite and over-determined, it’s the best big budget action film I’ve seen this year. In fact, one character makes a joke at the film’s expense when he describes the bloody battles in the corridors of the train as “a true blockbuster.” It’s definitely a movie that knows what it’s about. Another movie that really knows what it’s about is “The Past,” by far the best thing I’ve seen at this year’s festival. Fresh from his Oscar triumph with “A Separation,” Iranian director Asghar Farhadi goes abroad, to Paris, to further explore the emotional ins and outs of marital dissolution. It was screened in the Window on Asian Cinema section because of the director’s nationality, but to me it’s a French production through and through, and though three of the main characters are Middle Eastern by origin, their backgrounds are almost incidental. (One is an illegal, which plays an important part in the plot, but she could have been from any country) The story is so well-thought out dramatically that I almost don’t trust my feelings, but they were pretty strong for the whole 130 minutes. Ahmar, an Iranian, has been separated from his wife, Marie, for four years and flies into Paris to finalize their divorce. He discovers that she is living with a man, an Arab named Samir, and is also pregnant by him. Ahmar is close to Marie’s two daughters by a previous husband, and the older, Lucie, is angry about her mother’s affair with Samir, and though he doesn’t want to get involved Ahmar is sucked into this domestic melodrama by dint of his own sense of responsibility. The reason for the divorce doesn’t become clear until halfway through, but it’s enough to say that while Marie is almost preternaturally irresponsible, Ahmar’s leaving hurt Lucie, and her resentment of the affair goes beyond the fear that “this one will just leave again after a few years.” Samir’s wife is in a coma following a suicide attempt, and Lucie thinks it’s because of the affair. It turns out to be not so simple, and, in fact, the truth is, for all intents and purposes, unknowable in this case. It’s to Farhadi’s great credit that he keeps this reality at the forefront of the story while revealing one startling secret after another. Some people will say the plotting is too pat, but I found it just messy enough thanks to the specificity of the characterizations. There is one amazing scene where Samir attempts to explain death to his five-year-old son in the Paris Metro. Every parent should see the movie just for that scene. Anyway, back to Tokyo today, weather permitting. This entry was posted in Movies and tagged Asghar Farhadi, Lee Kang Sheng, Snowpiercer, Tsai Ming Liang. Bookmark the permalink.